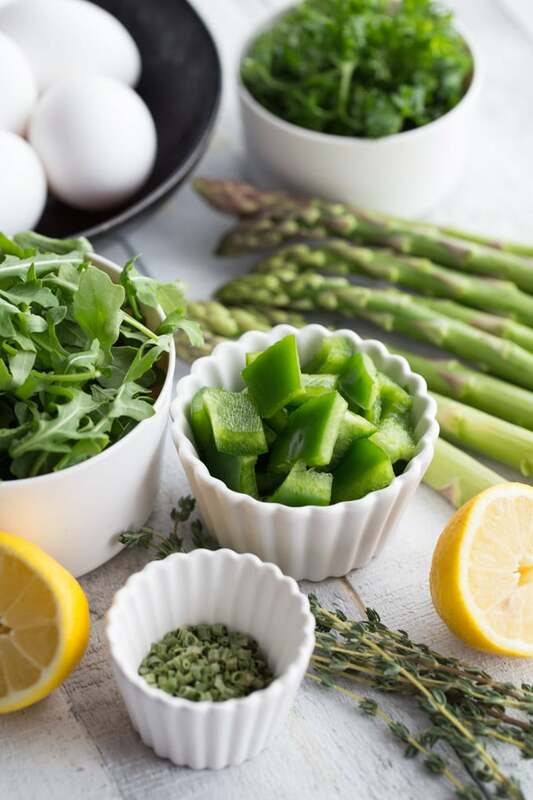 I’m all about brunching, especially brunching at home on the weekends since I get to stay in the comfort of my jammies 😉 Love asparagus and all the green goin’ on here. For some reason, I’m thinking ham needs to make an appearance as a side for green eggs and ham, lol. I could see myself enjoying this one for lunch too! Total YUM Leanne! Cheers to a lovely weekend! I’m all about home brunching in my PJs! And love your idea of ham as a side. A little throwback to Dr. Seuss is perfect!! Quiche makes an awesome lunch, with a little side salad. I’ve been taking it to work all week! Happy weekend Dawn! Hope it’s a good one! My mind is blown. This looks SO GOOD, Leanne! SO GOOD! 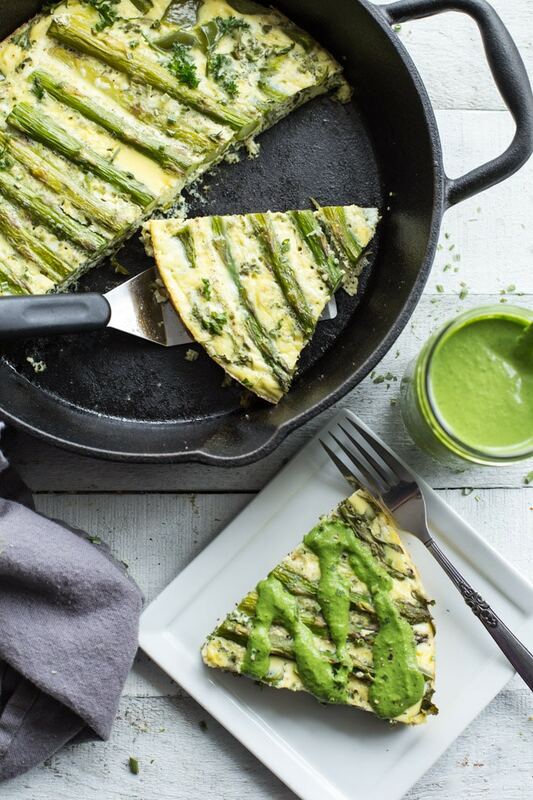 All those green veggies packed into one deliciously brunch-able treat! I’m telling Cookie to make this for me for Mother’s Day :). Have a great weekend, my dear! Thanks Kelsie! I definitely packed a lot of greens in there. And it’s absolutely a perfect dish for Mother’s Day! If Cookie needs any guidance, just let me know! 😉 Happy weekend! Thanks Annie! Glad I could provide that little nudge! Have a lovely weekend! Thanks Terry! 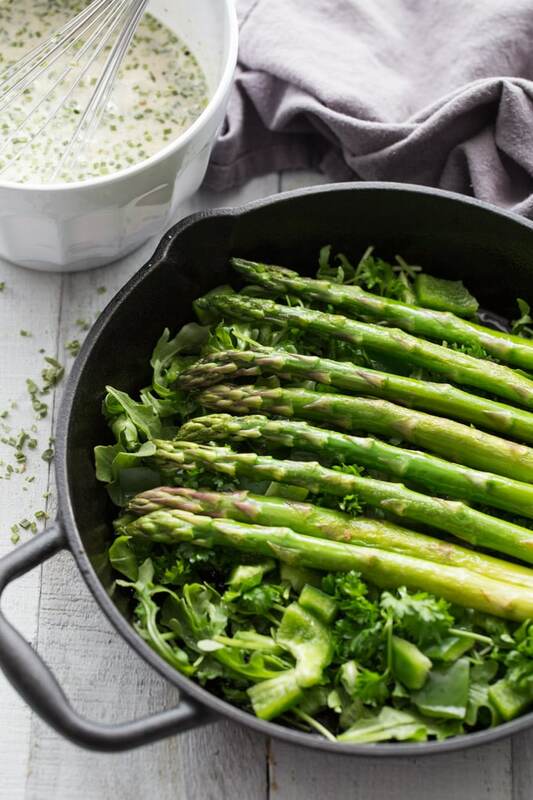 Asparagus is definitely something I eat a lot of this time of year! Hope you find a nice, fresh bunch! This quiche has everything I love in it and screams spring! That dressing would just be the icing on the cake so to speak. Even though we got snow this week my tastebuds and cooking are still instinctually heading in the spring direction and this is right on point. Take care. Thanks Stacey! I’m loving all the spring flavours lately, so I couldn’t resist making this quiche. Luckily, all our snow is gone, but it has been cold and windy lately. Hope spring weather is around the corner for you. Happy weekend friend! Loving all the green!! I love everything saucy so I need a heavy drizzle of that yummy sauce. Thanks Patrick! The recipe makes a lot, so feel free to go heavy on the jalapeño tahini dressing! I am anxiously awaiting the warmer weather here, too!! It snowed today and I’ve just HAD it! I think this quiche would definitely get me in the mood for spring and summer brunching though! I love the looks of that sauce! Thanks Katherine! This quiche definitely put me in the mood for spring this week! While it’s sunny here today, I think there might be a bit of snow in the forecast this weekend. I hope you guys get some warmer weather soon! Happy weekend! I agree with you…spring and summer brunches are more fun! 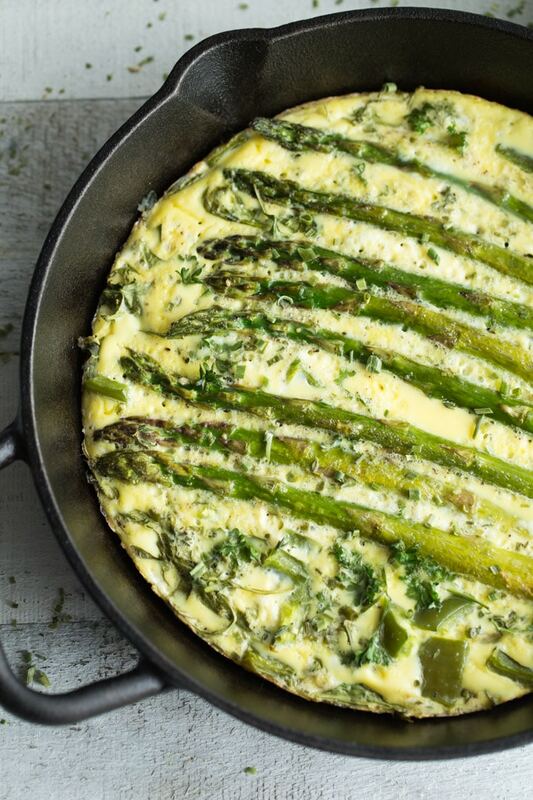 I always prefer a crustless quiche and this one is so beautiful with all the beautiful green produce (especially that asparagus!). This is just lovely and I want to eat it every weekend until spring is over! Thanks Marcie! 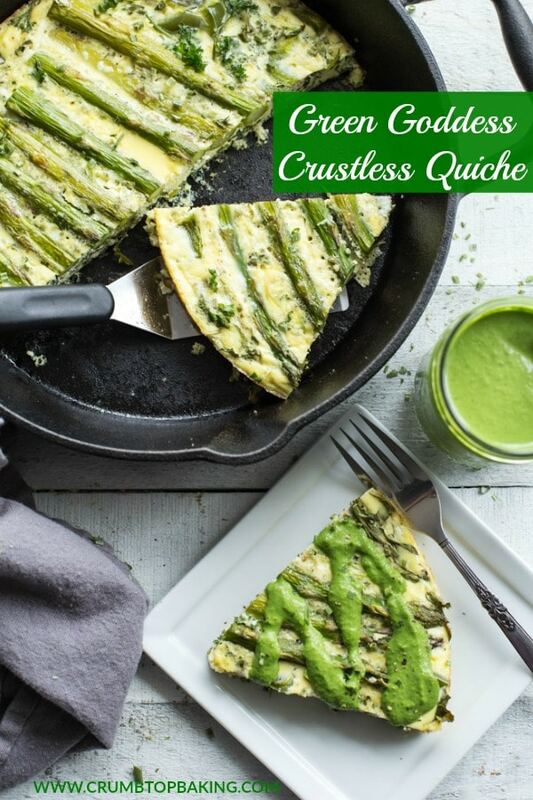 Crustless quiche is a favourite of mine too! And I love to stuff all sorts of greens into them, especially asparagus this time of year. Happy weekend and happy brunching! I’ve totally had quiche on the brain lately, and this isn’t helping 😉 I’m definitely going to be making one this weekend. I typically hesitate, because my husband won’t eat so I’m left eating eggs for dayyyyyyys, but there are worse situations to be in. I love the Green Goddess spin here! Thanks Dana! I was definitely eating eggs for days as I was recipe testing this quiche! But it made the perfect lunch for busy workdays, so I can’t complain! Have a great weekend! Perhaps you can make yourself a little mini quiche to enjoy!? Hi Leanne! Your green goddess calls for Spring! It looks so fresh and fluffy! I love brunch specially those when everything is ready to eat and everybody is happy! I think that your quiche will fit perfectly in that ! Thanks Nathalie! I love brunch too, especially during spring! Quiche is perfect to make ahead, so you can enjoy your company while it’s baking! Hope you’re having a great weekend! Holy mother of awesomeness! I don’t eat a ton of quiche but I would down this in an instant! Even though I adore me some comfort foods during the winter I love lighter cuisine this time of year in anticipation of the warm months to come!! 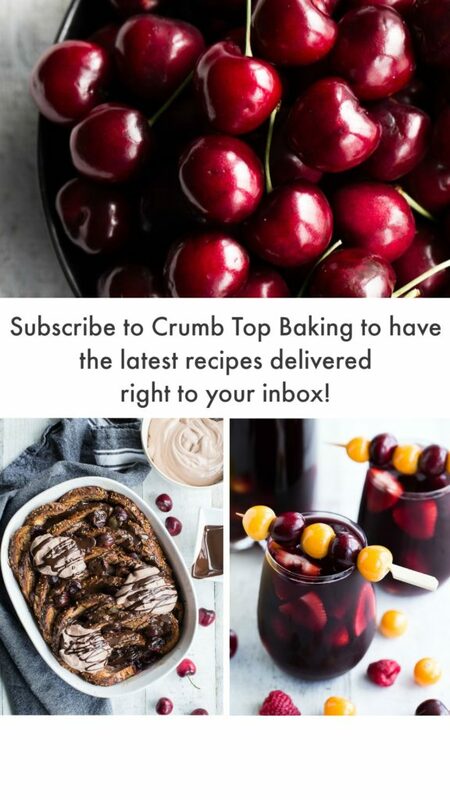 This recipe looks and sounds utterly mouthwatering! Thanks Christina! It’s definitely a lighter dish appropriate for spring! And one I’ll be making a number of times for summer gatherings! Have a lovely week friend! Who needs a crust with all of this deliciousness going on?! I would eat this for dinner too! Thanks Lisa! You really don’t miss the crust. And yes, I’ve been enjoying this quiche for lunch and dinner too! 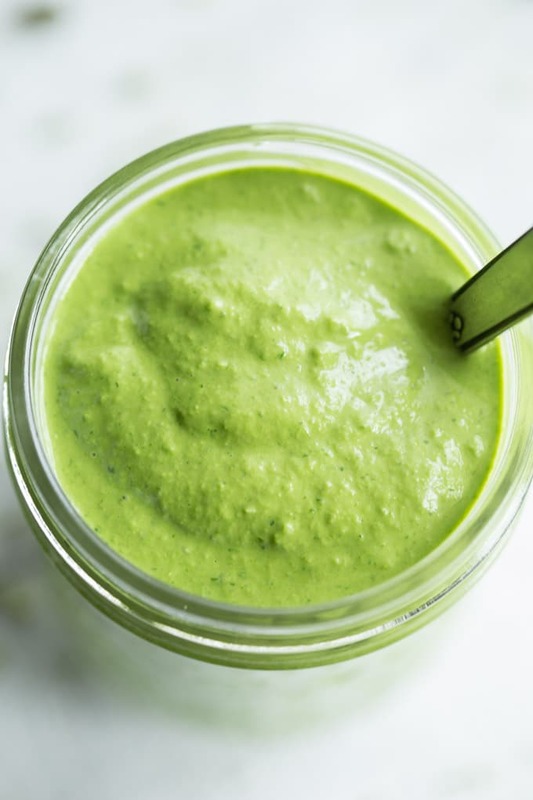 Leanne, the green of this is so all about spring, and what I love best is that jalapeno tahini dressing. It sounds AMAZING. I can’t wait to try it. Thanks for sharing! Thanks Colleen! The dressing might be my favourite part too! I’ve been using it as a topping for salads and turkey burgers too! 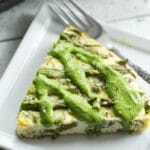 I’ve been thinking of making a savory tart lately, but I wanted something more exciting than just an asparagus pie. I guess, I’ve just found the answer. You’ve lifted the traditional idea up to a new level, Leanne! 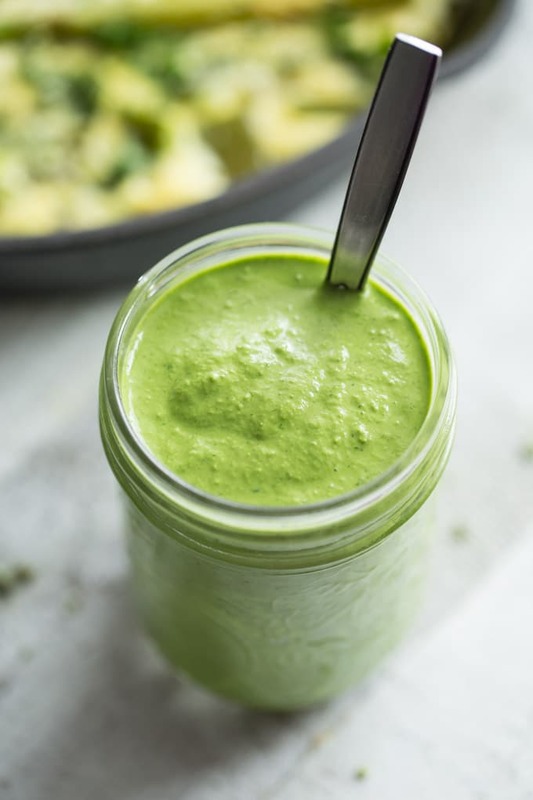 And I love this tahini jalapeno dressing too – so interesting! Thanks Ben! I’m sure your savoury tart will taste amazing! Happy my quiche could inspire you. 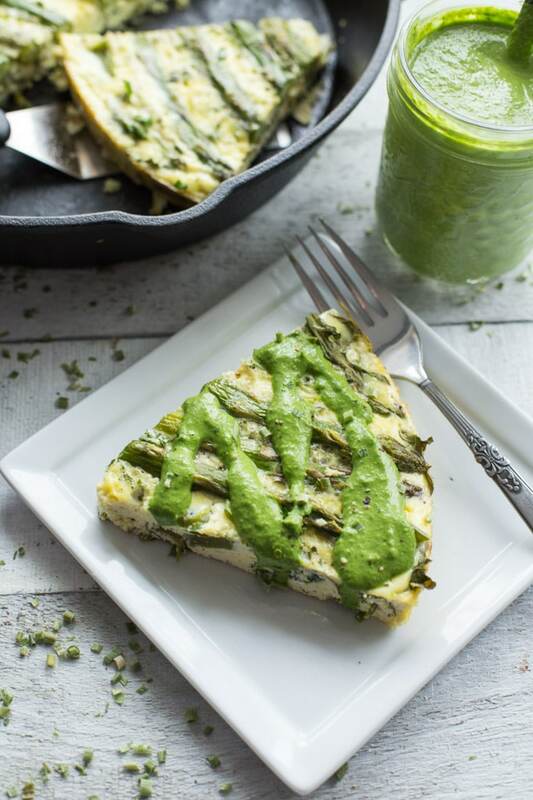 The jalapeño tahini dressing is a must with this quiche, and works well on salads too! Happy Monday! I love all of the amazing fresh GREEN ingredients here! I have this in the plans for brunch soon! Thanks Tanya! I’m so glad! Be sure to let me know what you think when you make it! Happy brunching! Thanks Ashika! I had Mother’s Day brunch in mind when I was making it!